Information gathered over the years. Introduction: The purpose of this lab is to analyze the properties of a telephoto lens system. This is a system of lenses that provide a long focal length in a relatively short optical system. We will specifically focus on the effective focal lengths and principal planes formed by such telephoto lens systems. Procedure: In this section, we will analyze 2 lenses, a converging lens and a diverging lens. Our objective is to apply the given formula to solve for various unknowns in the problem. This is the lens system we used! In this section of the lab, we will use a simple telephoto lens system that consists of only 2 lenses. We will observe 2 light sources that are placed far away from the telephoto lens. 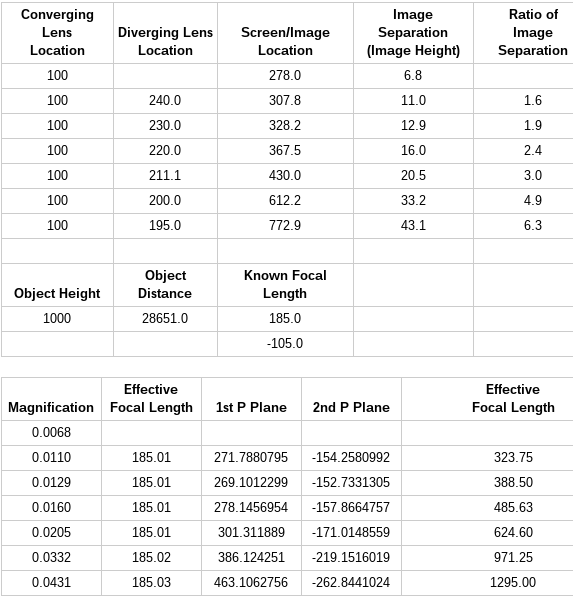 Our goal is to determine the equivalent focal length of the telephoto lens by comparing the image separation of a single lens with known focal length and the lens combination. Behind the lens is an image screen where the image can be viewed at a known distance from the lens. The image height is determined by measuring the separation of the 2 light sources on the image screen. This should also confirm the known focal length of the single converging lens. A diverging lens is now placed about 140 mm behind the converging lens. We carefully adjust the height of the lens so that they are equal. We ensure that the axis are parallel. A series of measurements can now be taken. In each measurement, we are to determine the “image height” by measuring the separation between the 2 points of light on the image screen. With each subsequent measurement, we are to move the diverging lens 10 mm at a time and adjust the image screen accordingly so that the image is in focus. Each iteration will provide a different image height. The discrepancy between measured and theoretical focal lengths increases as we decrease the diverging lens locations, subsequently increasing the image location’s distance exponentially. When combining 2 (or more) lenses in a system, it is possible to create an output that produces a focal length different from either of the other lenses. This new focal length is termed “effective focal length”. The effective focal length depends on the properties of the lenses used, but also the separation between them, so that it is possible to create many different effective focal lengths from a simple configuration of lenses. This phenomenon is largely applicable in situations where a large focal length is desired but requires a relatively small system to produce the output. May 20, 2015 in Academics, Optics.